Inevitably when opening old world wines we’ll occasionally come across some which are either corked or oxidised, and not at their best. These bottles (depending how drunk and discerning we are) are usually relegated to a spot beside the stove for cooking and over time we’ve accumulated quite a collection. As a result I’m always on the lookout for recipes requiring a splash of plonk or two. The reds are easily used up in hearty stews and slow braises but the whites, which we mostly use for moules marinières, tend to linger a wee longer. In that regard Bill Granger’s Coq au Vin (from the recently reviewed Bill’s Basics) has been a godsend. It calls for white instead of the standard red wine, is super quick to throw together and utterly delish – a gorgeous mix of crispy-skinned chicken and fragrant mushrooms doused in a sultry wine sauce. Speedy enough for a midweek meal yet impressive enough for get-togethers with mates. I’ve adapted the recipe a little, reducing the pan juices and adding a splash of cream at the end to create a heavenly gravy that just screams out for some crusty baguette. Preheat oven to 220°C (428°F). Place the chicken pieces in a large roasting tray and scatter over the pancetta, shallots, thyme, rosemary and chilli flakes. Season liberally with salt and black pepper and drizzle with 2 tbsp of the olive oil. Pop in the preheated oven and roast for 20 minutes. Pour over the wine and roast for another 20-25 minutes. Meanwhile heat the remaining oil and butter in a large pan and toss in the mushrooms and garlic. Fry for a few minutes until cooked and golden (don’t move the mushrooms around too much before flipping to allow them to colour). When the chicken is done remove from the oven and lift the chicken onto the serving dish to rest. Reduce the roasting juices (either in the baking vessel or a separate pan) by a little then add the cream and chuck in the parsley to finish, simmering for a minute or two to let it all meld together. Season to taste. 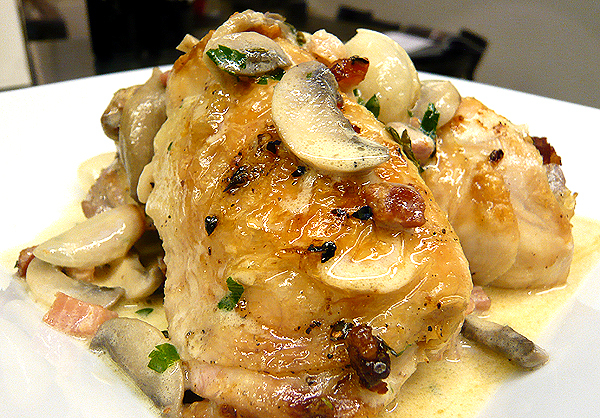 Top the chicken with mushrooms and pour over the sauce to serve. Eat with crusty bread and a simple green salad. ~ by gourmettraveller on October 20, 2010. I’ve got some white in the fridge that needs to be used soon. I will definitely be making this! I had an open white in the fridge and some thighs so could not ignore this recipe. It tasted great and looks good too, minimal fuss to prep and cook too makes this a very well-worth recipe to have on standby….. Bill’s book has already been orderd! Wow, that was quick! So glad you loved it as much as me. Let me know how you get on with the rest of the recipes – am contemplating what to try next! This recipe looks so delicious! I bet the house smelled amazing! Like this one, not too many ingredients and the white wine is a bit more summery. Just back from France and my daughter ordered C au V at a restaurant near Beaune in the Burgandy region, just a bit too intense for the season. I found this site when searching for recipies for a French themed dinner party tonight. Thanks! And I did this. Followed the recipe to a tee. 20 chicken thighs in a baking dish was a challenge, but I used a shallow grill tray lined with foil to stop the juices spilling over. My guests loved it and I will do it again.